Hello, all! Sorry its been so long since my last post. Its not that I havent been crafting, I've just been too busy to post. Here are two quick pics of a sweater that I started over two years ago and put down, for whatever reason. 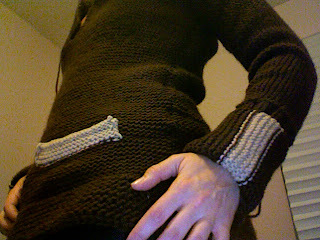 I vowed I would finish it over the holiday, which I did, minus the buttons which I need to purchase. 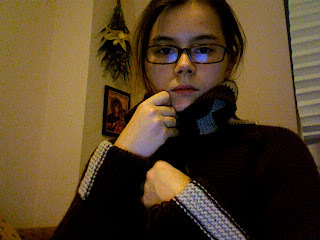 You can also see that I still have a few ends to sew in. PS: Tried to scan the pattern with all my corrections, but its not working right now. Look for that soon! Announcing the 283 Ladies Crafting Circle!